Teemu Mattsson studied at Sibelius Academy, like many other musicians at the UMO Jazz Orchestra, and got to collaborate already early on, through the Academy’s concert productions, with several international names including Ron McClure, Wayne Krantz, Dave Liebman, Jim Beard, and Palle Mikkelborg. In addition to the UMO Jazz Orchestra, Mattsson plays in the Riku Niemi Orchestra. He has also played on many pop artists’ records – among the most unusual being with the Finnish group, Martti Servo ja Napander. He also works as a musician at Helsinki City Theatre. Mattsson gets into music with his whole being and possesses a great sense of rhythm. He composes music for his own quintet, which has released two albums. 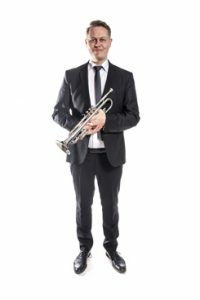 Mattsson’s role at UMO is to play the lead trumpet, but in his own quintet he is heard more often as a soloist.